Rebecca Umbach, a former Penn doctoral student, who published research in the Journal of Experimental Criminology studying daylight saving time and crime. By 2020, city-owned buildings in Philadelphia are slated to get 22 percent of their electricity from a solar farm to be built for that purpose under an ordinance introduced Thursday by City Council. The large-scale solar farm would be located in rural Adams County, about 100 miles west of the city. "We're very excited about this," said Christine Knapp, director of the city's Office of Sustainability, who believes the deal will help drive regional demand for renewable energy sources. Under the deal, Radnor-based Community Energy Solar would develop the 70 megawatt solar farm, not far from Gettysburg. Community Energy has already formed Adams Solar LLC to operate what would become the largest solar farm in the state by far. The Philadelphia Energy Authority, a city agency that buys power, would be locked into a 20-year deal to purchase 100 percent of the energy generated by Adams Solar. Knapp said the deal would prevent the city's electricity rates from rising even if rates from fossil fuel-based plants go up. The city will pay $44.50 per megawatt hour, about what it's paying now. The electricity will be used to power a portion of city-owned buildings such as City Hall, Philadelphia International Airport, and the Water Department. Knapp said all the details need to be worked out before the end of the year, so construction can start before federal energy credits begin stepping down at the end of 2019. Companies get tax credits for solar. Construction could begin by fall 2019 and be complete by 2020. Electricity generated by the farm would flow into the regional grid coordinated by PJM Interconnection, since there's no way to transmit directly. But Philadelphia would take market ownership of the electricity, which would be delivered to Peco territory. The energy would not be generated for residential or commercial use. Nationally, other municipalities have used similar plans for solar, but this would be the first plan of this scale used in Pennsylvania. "We think this is a nice way to lead by example," Knapp said. "It's not in common use yet." Community Energy has agreed to hire Philadelphians as part of the deal. Philadelphia began seeking proposals for solar about a year ago. The city owns 600 buildings and has pledged to get 100 percent of its electricity from renewable sources by 2030. Knapp said the deal is only the beginning for similar power purchase agreements within the city. Last month, Philadelphia won an award that could total $2 million or more from the Bloomberg American Cities Climate Challenge for its efforts to address climate change and sustainability. Part of that money could be used to extend collaborative renewable power purchase agreements to businesses. Currently, the city's 3,000 biggest commercial buildings account for 17 percent of all carbon emissions, so bringing those numbers down could seriously reduce the city's carbon footprint, Knapp said. 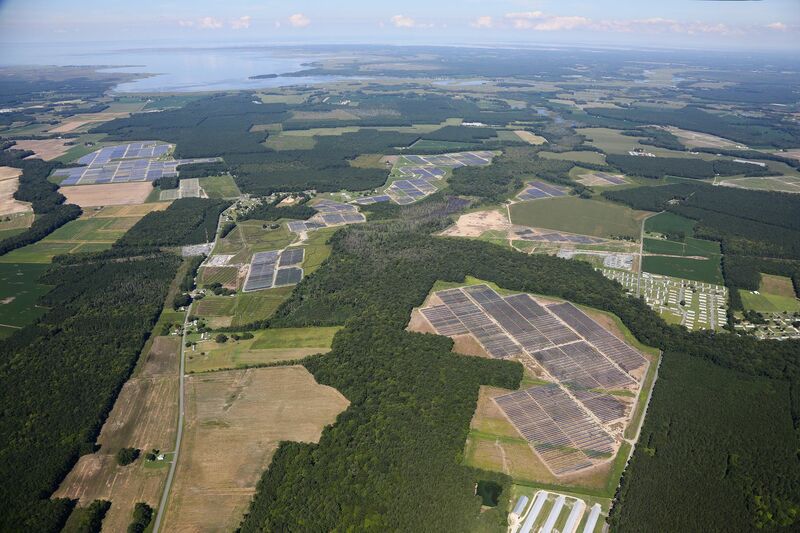 Community Energy Solar has already developed a 100 megawatt solar farm for Amazon in Virginia. It has also developed solar projects in Burlington and Gloucester Counties in New Jersey, as well as projects for Elizabethtown College and Keystone Solar in Lancaster. Brent Alderfer, CEO and co-founder of Community Energy, said the company began developing the project several years ago in Straban Township, arranging leases with landowners in order to stitch together about 500 acres for the solar farm. It has also begun the permitting process, as well as engineering needed to connect to the power grid. "It's exciting to us," Alderfer said of the deal to build the largest solar farm in the state. The next largest is about 12 megawatts, he said. He said the solar panels will be equipped to track the sun from east to west during the day for high efficiency. Council's final approval will allow the company to get financing. Alderfer said he believes the project could be complete by spring or summer of 2020. In a statement, Mayor Kenney said, "Philadelphia wants to lead by example in procuring renewable energy, which will reduce regional carbon emissions to help meet our climate goals and create regional job growth in the renewable energy sector." The bill, which still needs full approval, was introduced by Councilwoman Blondell Reynolds Brown, chair of Council's committee on the environment. "Moving forward in a tangible matter with this goal symbolizes how we grow towards a greener and more sustainable Philadelphia," Reynolds Brown said. Earlier this month, SEPTA put out a similar proposal to convert 10 percent to 20 percent of its energy consumption to renewable sources, such as solar panels or windmills. The transit agency, one of the largest energy consumers in the region, uses 480,000 megawatt hours a year of electricity for services such as trolleys, trains, and facilities. All of that power is drawn from the electrical grid, which uses primarily coal, nuclear, and natural gas. It hopes to have a deal by next year.